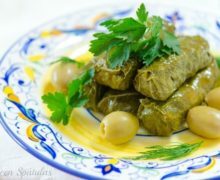 This Stuffed Grape Leaves recipe has ground beef, lemon, herbs, and other delicious ingredients for a great addition to any appetizer platter! Every time I make stuffed grape leaves I hope that I will finally grow tired of them. Like any “fill as you go” item (e.g. asian dumplings or pesto zucchini bites), you have to roll these dolmades one by one, which makes them a bit tedious and time consuming to make. But despite being a slightly high maintenance recipe, I can never stop making these lemony stuffed grape leaves because they’re too darned good. The best solution I have come up with is to invite a few good friends over to chat away, have a drink, and knock out these stuffed grape leaves together. It works pretty well. If you’ve never had stuffed grape leaves before, the appearance is just a little off-putting, isn’t it? I will be the first to admit that. The first time I was offered one, I thought “ehhh…what is that? 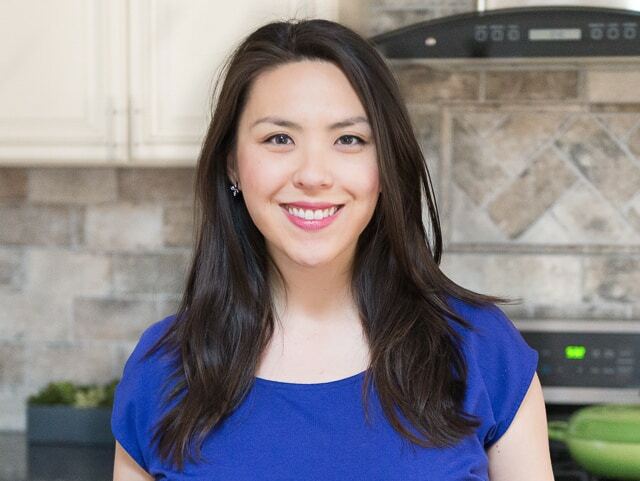 !” but when I closed my eyes and took a bite, I was hooked. When talking about stuffed grape leaves, it’s totally appropriate to use the word “flavor explosion,” because that’s what these are. Lots of good things in this hearty filling! Place little scoops of filling onto each grape leaf, and roll it up just like a burrito by bringing up the bottom, folding in the sides, and rolling. Nestle all of your stuffed grape leaves together tightly in a pot, then pour freshly squeezed lemon juice all over them. Simmering the stuffed grape leaves in the lemon really balances out the potential heaviness of the meat and rice. 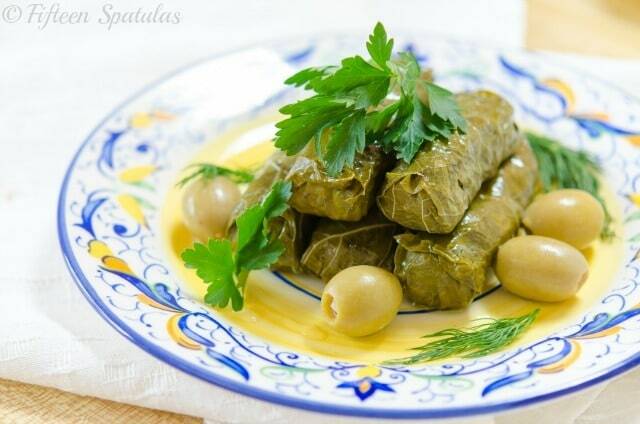 The herbs and lemon really make these dolmades great! 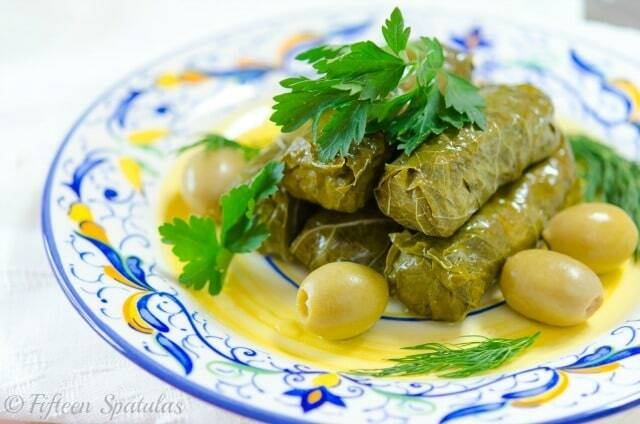 You can serve the stuffed grape leaves warm or cold…I personally love them warm! You can throw a few olives on the plate too. Enjoy! 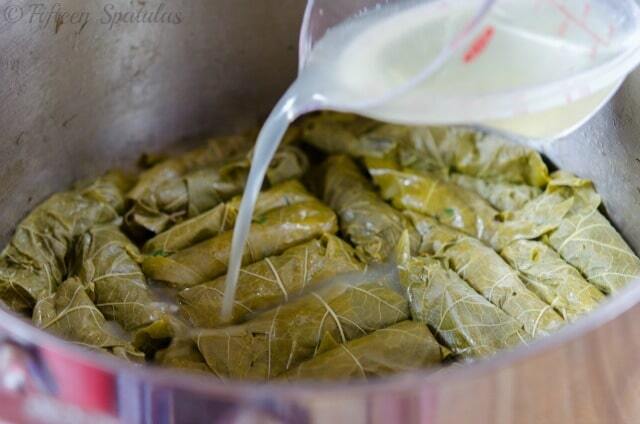 Boil the grape leaves for 5 minutes, then drain. 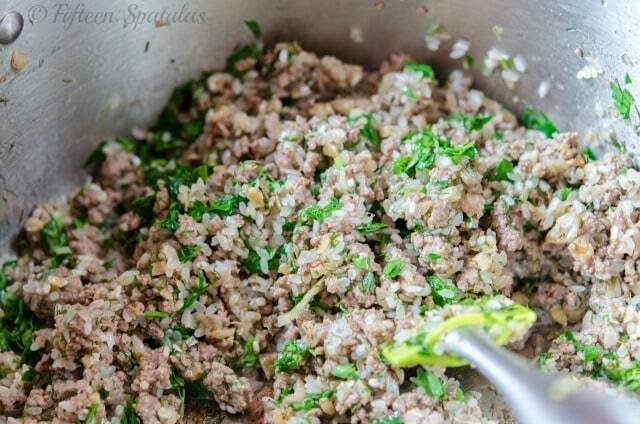 This softens the grape leaves and make them easier to roll. Heat the olive oil in a pot over medium heat, add the onions with 1/4 tsp of salt, and cook for 10 minutes to soften. 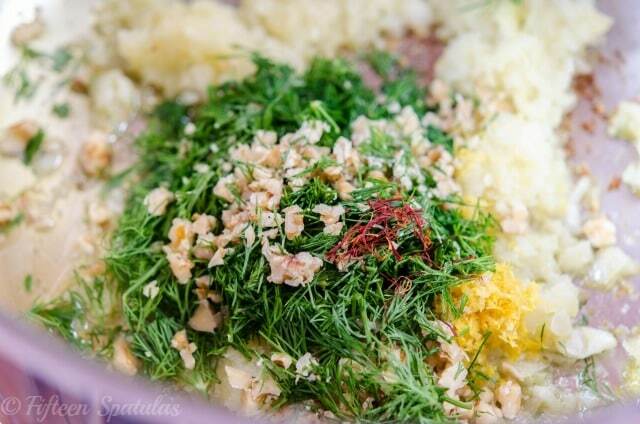 Add the walnuts, dill, lemon zest, saffron, and stir it in. Bump the heat up to medium high, and add the beef with 1/4 tsp salt. Cook the beef for 5-8 minutes until fully browned and cooked through. 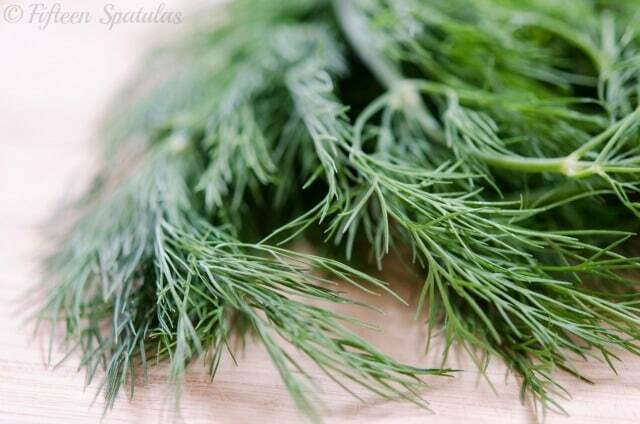 Add the chopped parsley, rice + water, and another 1/4 tsp of salt. Cover the pot with a lid and cook for about 20 minutes until the water has been absorbed. The rice should be al dente but not completely cooked. Remove the pot from the heat. 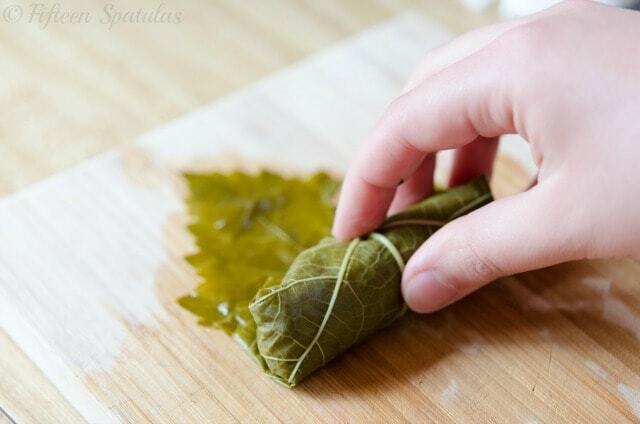 Place a spoonful of filling into each grape leaf, and roll it up by bringing up the bottom, folding over the sides, and rolling it like a burrito. Place the stuffed grape leaf in the bottom of a pot. 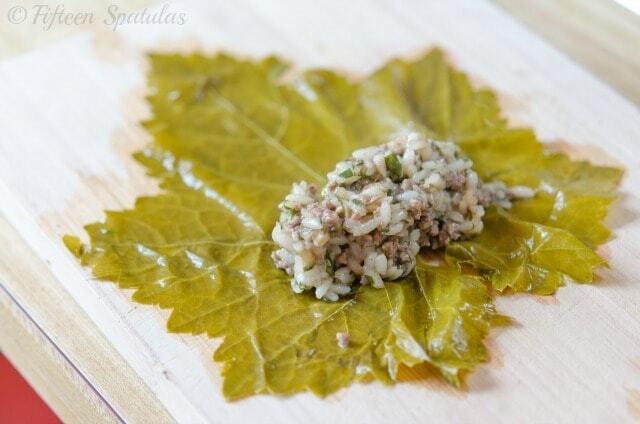 Repeat with the remaining filling and pack the grape leaves snugly together in a single layer. If your stuffed grape leaves must overflow into a second layer, that’s fine, just try to keep them tightly together so they don’t roll open during the final cooking. Pour over the freshly squeezed lemon juice and simmer on low heat, covered, for 30 minutes. You’re done with cooking! Note that if you taste a dolma right now, it will taste extremely lemony. This lemon flavor will dissipate in the next hour or so, so let the dolmas sit in the fridge for a few hours before eating. Enjoy! Made this with a few girlfriends for some helping hands, and we all loved the results. Thanks!